It is Brain Awareness Month. This is my specialty of 28 years. At a meeting of the medical society one doctor asked how to tell if an aneurysm is going to burst. They had no answer. The answer—genetics. Genetics can and should change the way we practice medicine. Genes offer a clue as to whether an aneurysm will burst or not. Genetic data is needed on these patients. MRI Consultants offers genetic testing for the BRCA1 gene or BRCA2 gene. Rather than having to have a lengthy and expensive consultation with the genetics department of the hospital, your genetic sample is gathered (blood draw or cells from your mouth) for a small fee and sent to a national genetic testing facility, no referral needed. The lab consults with your insurance and the cost to the patient is frequently as low as $99. Inflammation is also part of the answer. An aneurysm about to rupture has a weakness in its wall. This means that a patient’s immune system is trying to wall-off the aneurysm and there could be some inflammation near the weakest portion of the wall. One needs the highest level of resolution to properly image this. At the moment, 3.0T is the highest level of MRI currently available. The current generation of 0.3T (yes, 0.3, not 3.0 … some very old machines are still being used and charge the same as their modern counterparts) even 1.5T MRI scanners are not capable of this. Be sure to ASK how strong the MRI Scanner you choose for your MRI study—no matter where it is done. With MRI – resolution is time. The lower resolution the scan, the longer it takes. Higher resolution means less time in the scanner. This is very important for a claustrophobic patient. A 32-channel 3T MRI system is about 6 times faster. In 6 minutes of scan time a 32-channel 3T scanner is able to produce images that would take about 50 minutes in other scanners. A complete r/o stroke study in a 3T 32 channel scanner takes as little as 6 minutes. 3T MRI with DWIBS is super sensitive to lymph nodes. It is also 100% sensitive for breast cancer (For more info: www.3tbreastmri.com). 3T MRI is superior all other MR imaging for Breast MRI. If you have your MRI done on a lesser MRI scanner you will always wonder if 3T would have seen the problem. Be certain – demand a 3T MRI. Many people—even Doctors—are totally unaware thatMRI comes in several levels of quality … ranging from “fuzzy” images to ones that are crystal clear. We do body diffusion weighted imaging (“DWI”). We do this on both of our scanners at no additional charge on our abdomen studies. In the brain, this technique shows early strokes or TIAs. In the body, it shows tumors of the GI tract and of the kidneys. Just last year two pancreatic cancers were found. DWIBS takes this even further. On 32-channel 3T scanner every tiny lymph node in your body can be seen. And that can change the staging of cancer or detect inflammation. Lastly, the current system of medicine is flawed. In many discussions it is mentioned that doctors were trying to help patients when they were simply too ill—and then millions of dollars were thrown at the patient’s disease after it was too late. Early screening (detecting these problems before they happened) was never mentioned and it might have stopped the train-wreck of a patient who had a large completed stroke. Please ask us how. MRI Consultants offers the best technology in MRI in Delaware. Even our “open” MRI is an 18-channel 1.5T MRI scanner! (Ask your MRI provider how many channels his closed magnet has). We prefer to do our Breast MRI’s on our 3T MRI because of its extraordinary sensitivity, but for someone who either will not fit, or who is extremely claustrophobic, our 18-channel 1.5T OPEN BORE MRI is a good alternative. Getting a bad MRI (They exist…Really) costs no less then getting the very Best MRI possible, repeating an inferior study however, will cost time. Get the best from the start. 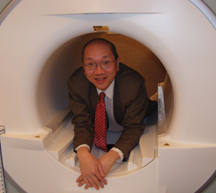 Ask Dr. Chao—who has 28 years experience in MRI. He gives free advice! For more information on this and other MRI-related issues, check our websites: www.mriconsultants.net www.bestopenmri.net. For people without insurance, we offer a $500 Out-of-Pocket discount and for those who are truly claustrophobic, we offer IV sedation for free. We try to make your MRI experience as low-stress as possible. This patient has the BRCAII gene. The tumor shown was biopsied (missed) and called benign on the upper image. The lower image is the same patient one year later. 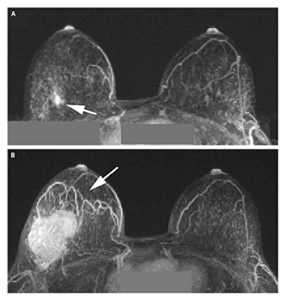 This is why we suggest 6 months screening after breast biopsy.